For the easiest access to SkyDrive, install Microsoft’s SkyDrive for Windows program on your Windows 8 tablet and on your desktop PC. To keep things simple, SkyDrive for Windows places a handy SkyDrive folder in the Navigation pane of every folder on your Windows desktop. Anytime you add folders or files to your computer’s SkyDrive folder, SkyDrive automatically synchronizes them with your SkyDrive space on the Internet. That makes those files available to all your computers, tablets, and phones. From the Windows desktop, download and install SkyDrive for Windows. Open Internet Explorer on the Windows desktop; then visit the SkyDrive for Windows website. Follow the instructions to download and install SkyDrive for Windows onto your tablet, as well as onto your desktop PC. That same website also offers apps for your Android, Apple, and Windows phones, so they can access your SkyDrive-stored files, as well. Windows RT tablets can’t install SkyDrive for Windows on the desktop. Instead, install SkyDrive for Windows on your home PC; then move to Step 2. Decide whether to make your PC or tablet’s files available to other devices; then tap the Done button. SkyDrive’s installation program tosses you an odd option before closing: Make Files on this PC Available to Me on my Other Devices. When asked, sign in with your Microsoft account. As SkyDrive finishes installing on your desktop, it asks you to sign in with your Microsoft account. Here, you type the same e-mail address and password you use when signing on to your tablet with a Microsoft account. When you finish downloading, installing, and signing on to SkyDrive, the program places a SkyDrive folder in the Navigation pane of every folder on your desktop. Copy files and folders to the SkyDrive folder. The SkyDrive folder works like any other folder on your PC. You can drag and drop folders and files into it. Or you can copy and paste files into the SkyDrive folder. Feel free to add files you might need while on the road: favorite photos, for example, favorite music, and backups of important files. 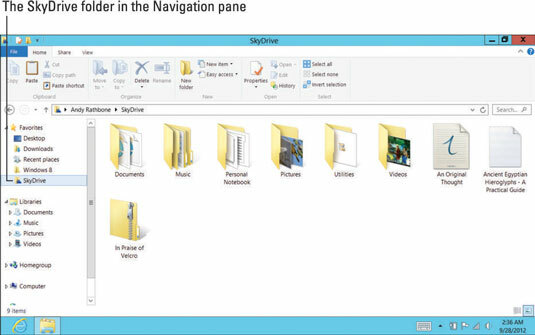 Include in Library: Choose this to stash your SkyDrive contents into one of your libraries. This comes in handy mainly for backup systems that automatically copy your libraries’ contents. SkyDrive Pro: This offers extra features for paying customers. Open Folder Location: Windows keeps a copy of your SkyDrive account’s contents on your own computer. Choose this option to see that folder’s contents. Open in New Window: This opens a new window showing your SkyDrive contents, handy when you want to drag and drop files into it from another window. Pin to Start: This places a Windows for SkyDrive tile on the Start screen, so you can jump to your desktop’s SkyDrive folder quickly.